Will be celebrating its 5th Anniversary 03 JAN 2013! and offer a special discount between the following period. *Creative Director Hiroki is not eligible for the offer. Don’t miss out on experiencing our amazing eyelash extension service – our expert technicians will use the highest quality products from Japan to ensure you get beautiful, comfortable and long-lasting results that are perfectly designed to suit your look and lifestyle, as well as to impress your friends! 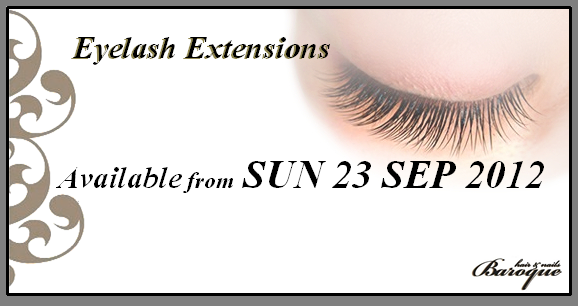 Special offer on Eyelash Extensions Application Until WED 31 OCT -15%OFF!!! Give us a call to make a bokking today…. Hello everyone. A summer nails special offer from Baroque! We are into a busy season with lots of events and holidays. To help you get your toes ready for your summer shoes we offer Gel Pedicure at 20% off during August when booked with a normal price Gel Manicure! A great offer Gel Manicure & Pedicure from £98! advance! Looking forward for your visits! Great for parties and holidays! All materials including extensions and adhesives are made in Japan. Services by an experienced eyelash technician, Hitomi. 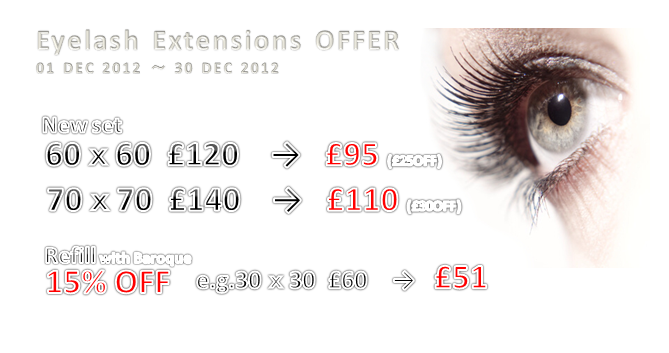 Offer valid for 50 or more extensions on each eye. Available on weekdays only. New nail designs. Nail art set menu available for limited time only. A great chance to try out our fabulous beauty services!